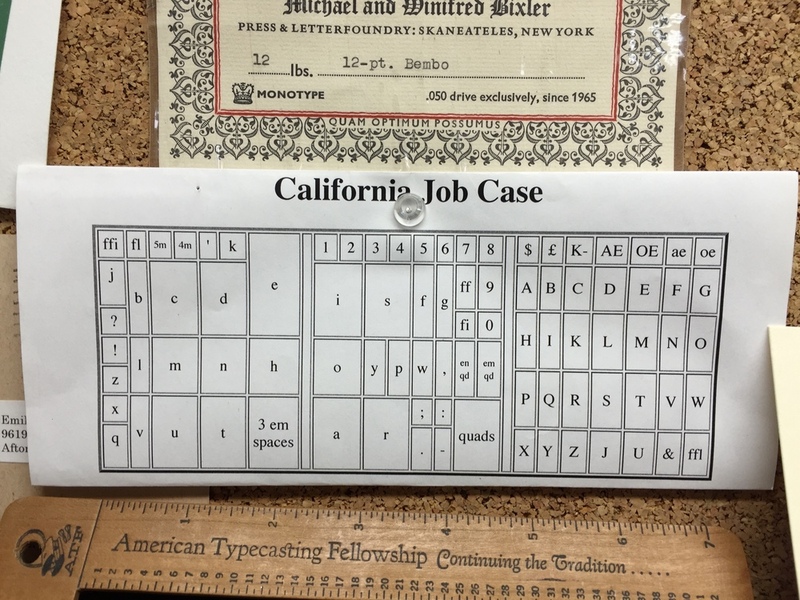 Here is the second installment in our occasional blog series about the words and phrases that identify printing's particular tools and processes ~ A Letterpress Lexicon. Enjoy! TYPECASE: A typecase is a wooden tray, divided up into numerous small compartments, in which the letters, numbers, and punctuation of a font of type are organized and stored. TYPESETTING: This refers to the action of composing words from the individual pieces of type. A printer reaches into their typecase, picks up the desired letter, and literally "sets" it in place beside the last letter placed. COMPOSING STICK: This is the tool that holds the pieces of type that are being set (or, "composed"). Usually made of brass or steel, the composing stick is held in the non-dominant hand while the typesetter lines up each desired letter. The stick is adjustable, according to how long the line of type needs to be. And here's a little video to put these three words together! Thanks so much for joining us on this journey into the World of Letterpress! If you haven't already, take a second to sign up below for our occasional newsletter, which features posts like this one, as well as updates on our printing projects here at St Brigid Press. We respect your privacy. We never share your information with anyone.